Before I started writing and illustrating kids' books, I did a weekly cartoon for Toronto's Now Magazine. I mined what I thought were entertaining factoids out of whatever I was reading or whoever I was listening to at the time, and illustrated these "truths" in scratchboard. I even called it, for a while, "True Stuff." Truth be told, I sometimes accepted as truth anecdotes told to me by other people, or things that came from dodgy sources such as supermarket tabloids. I admit, too, that I sometimes even made up some of what I drew. The above cartoon, however, was supposed to be one of the honest-to-gosh fact-based truths I'd come across and copied into my notebook. 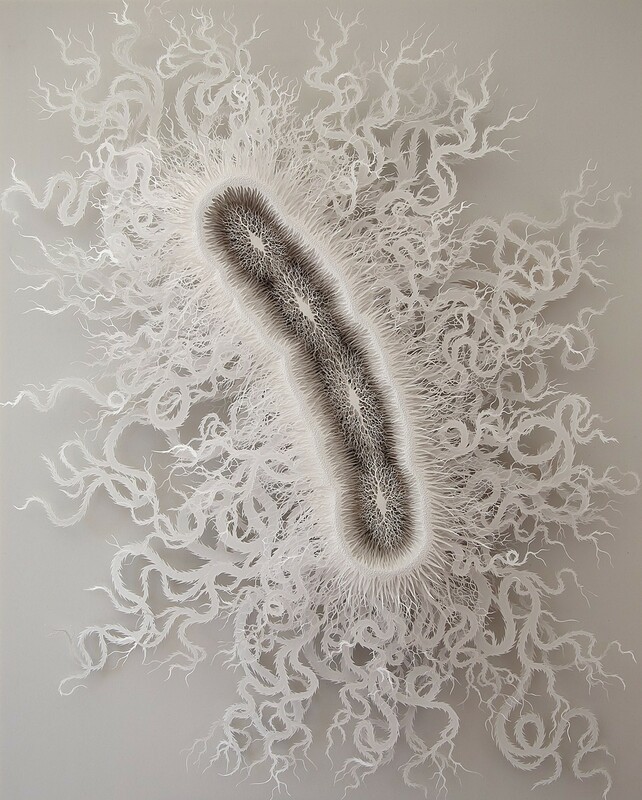 Perhaps you've heard or read something similar, something like "bacteria in the human body outnumber the body's own cells by 10:1." press his hand on a petri dish full of agar after he had been outside. When I first came across this "teacupful" tidbit back in 1985, without the luxury of having everything at my internet-connected fingertips like I do today (even in the woods, even in the middle of the night, even a hundred miles from the closest big city), my fact-finding abilities were heavily reliant on what I read in books, newspapers, and magazines. Back then, I had to trust what I read, mostly because it was so very difficult to question the veracity of the printed word. How, back then, if I had questioned the trustworthiness my source, would I have been able to verify if it was true? 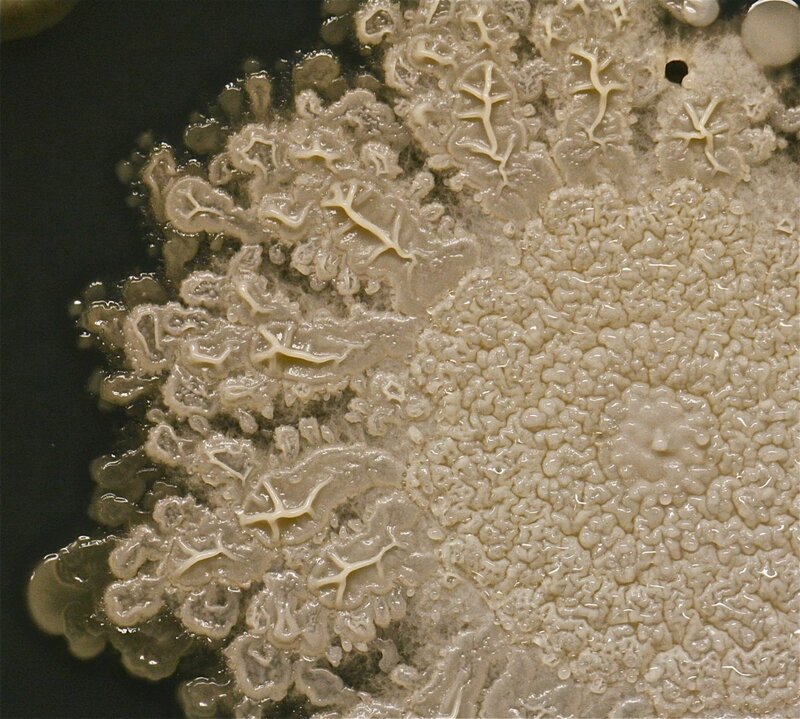 I mean, even if something like the above statement about "a teacupful" of bacteria was sourced from, say, a research paper in an obscure journal, how would I, a non-academic, have been able to access such a thing back then? 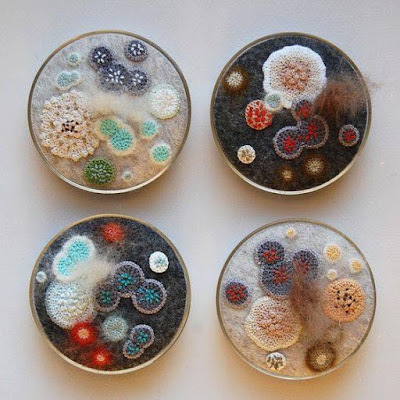 Back to the number of microbes on and inside a human body. I would never have fished out this old cartoon if I hadn't recently come across the following headline (on the internet, of course! ): "Scientists bust myth that our bodies have more bacteria than human cells." Here's the gist of what's come to light. This 10:1 bacteria-to-human-cell statistic, which gets almost nine thousand pre-2016 hits on Google, is based on a statement published in a review in 1977, a statement which had, in turn, been based on an earlier unsubstantiated calculation taken from a 1972 article. A group of researchers in Israel and Canada now say the ratio is more likely to be, on average, closer to one-to-one. Some people might have double that number of bacteria, some only half. And everyone loses almost their entire microbial load on a daily basis—at least they do if they're "regular," since the vast majority of human's bacteria reside in the colon. So the ten-to-one ratio is actually an academic urban legend. But there's the rub: I haven't actually read the new study, nor have I read either the journal article or the review from the 1970s that I've cited in this post. Am I lazy, or is it reasonable for me to trust the distilled versions of the paper that have been published on the websites of the journal Nature, the National Geographic, and Scientific American, among others? I can't answer that. All I know is that it's getting harder and harder to figure out what is believable, not just on the internet, but also in contemporary books since so many are now based on internet research. I just hope I rehashed the gist of what I've been reading about the current research without garbling it too much—because I'm obviously as capable as anyone else of modifying what I've read when I rehash it. 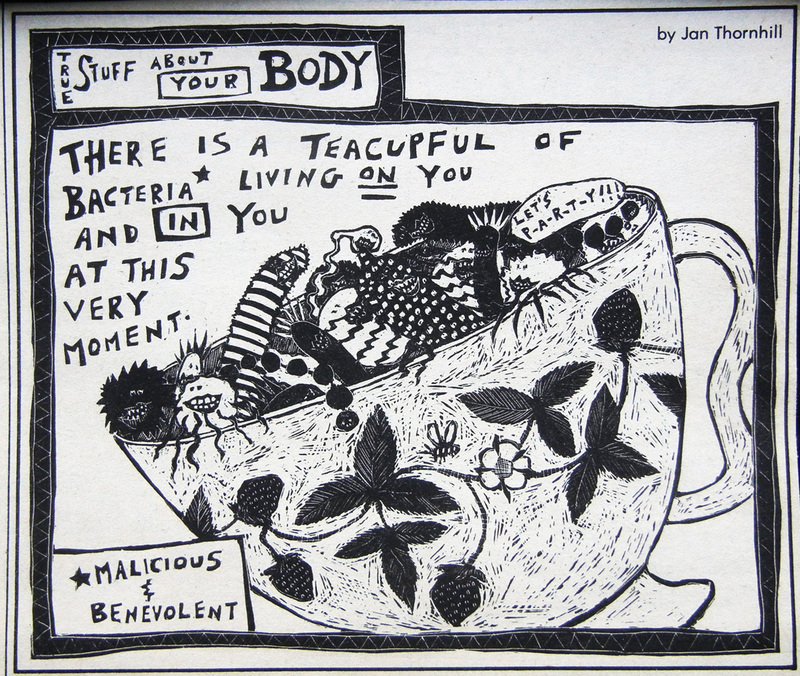 Take that original teacupful of bacteria "fact" I riffed off of all those years ago. 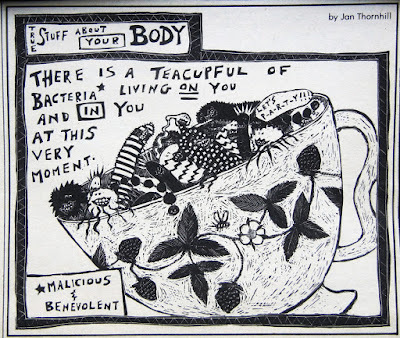 Even with the mighty internet I cannot find a specific reference anywhere to "a teacupful" of bacteria on the human body. What I have found, though, are two separate references to the mass of all those trillions of bacteria found in humans equalling that of "a teacup Yorkie" or as being "roughly the same weight as a teacup chihuahua." Perhaps I was guilty way back then of dropping a qualifier in my copying down of this cool little factoid! Check out our very own Helaine Becker's UBC article that highlights an academic urban legend about how pearls are formed! And if you happen to meet Helaine, ask her about Mendel's Peas. 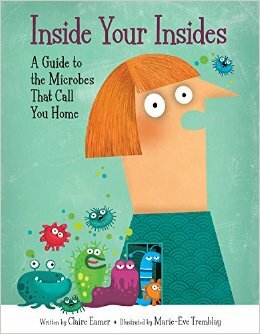 And if you want to know all about microbes and the human body, pre-order Inside Your Insides: A Guide to the Microbes That Call You Home, the latest book written by Sci/Why's own Claire Eamer (illustrated by Marie-Eve Tremblay)! At the first signs of spring, when the days get longer, the snow begins to melt from around the roots of the maple trees, and the temperatures rise to slightly above freezing during the day but stay cold at night, the sweet sap in the maple trees begins to flow. That's when both professionals and hobbyists tap sugar maples for sweet sap that is boiled until most of the water has evaporated. What's left is an amber-coloured liquid called maple syrup. The sugar in this sap was produced the previous year when sunlight, reacting with the chlorophyll of the leaves in sugar maples, produced sugar. This sugar was stored in the tree and released when the spring warmth caused the sap to rise from the winter-frozen roots. Sugar maple trees are unique to eastern North America. Their sweet sap was first harvested by Aboriginal tribes during the "maple moon." French and English explorers wrote of the "sweet water" that North American Indians took from the trees and boiled down to a coarse dark brown sugar. In the 18th and 19th centuries maple sugar was an important food item and was used for trading. By the late 19th century, however, white cane sugar, which was cheaper and easier to get, replaced maple sugar as the sweetener. This hobby bush is in a sugar maple stand near Parry Sound, ON. Today, maple syrup and sugar are made both by hobbyists and professionals. Commercial bushes use pipeline to move the spring sap to an evaporating shed where it is boiled in large commercial evaporators. Many hobbyists tap a small number of trees and make just enough syrup for their family and friends. In 1980, Mark Mason used a battery-powered drill to tap. In small bushes, the process begins when the hobbyist drills a hole in the tree trunk to collect some of the sap as it rises. A cone-shaped funnel or "spile" is hammered into each tap and a bucket hung from the hook attached to each spile. As each day warms, sap plinks into the buckets, creating a springtime maple melody. In most bushes, the sap is collected and poured into a large flat evaporating pan. The sap is boiled until the watery liquid gradually turns from pale yellow through gold, to a warm amber. This process uses up a lot of firewood, gas, or propane. In some commercial bushes, it's sped up by reverse osmosis. Partially boiled sap is poured into a hydrometer cup. Is it maple syrup yet? The work demands patience. About forty litres of sap produce only one litre of maple syrup. Making it demands hours of boiling, buckets of patience, and many maple trees. As the temperature of the boiling sap begins to rise, the specific gravity is checked. The finished product has a specific gravity of 1.37 and boils at exactly 104 °C. Traditionalists use a glass column called a hydrometer that will show about two-thirds of its length when the correct specific gravity has been reached. A felt sock filter purifies some dark syrup from late in the season. Once the syrup reaches this stage, it's quickly removed from heat, filtered to remove any impurities, and bottled or canned, ready for you to enjoy over pancakes or in your favourite maple recipe. Behaviour is what you do, culture is how you do it. This is totally obvious in human cultures, which have rules and guidelines for every behaviour - from table manners to what we wear to how we greet each other. But in the last few decades, scientists have begun to realize that animals have culture, too. 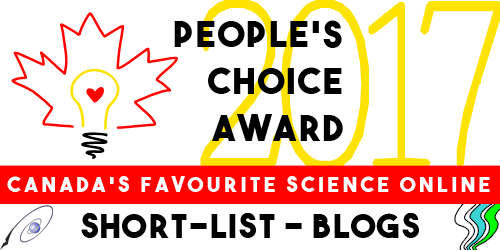 And we're not just talking about primates. A recent National Geographic's Weird Animal Question of the Week deals with accents and dialects in animal communication. One of their examples is wild canines, whose howls are not only distinctive between species - grey wolves and coyotes - but are also characteristic to particular geographic regions and populations. These differences probably help animals identify members, not just of their own family groups, but of their broader regions. 2) Find a mate in a new geographic region, thus passing its genetic material into the next generation. I discovered there was very little gene flow between tundra wolves and wolves living below the tree line, even though there were no physical impediments to travel between the areas. More surprising, there were several distinctive populations of wolves on the tundra, signalling low gene flow even among wolves living in what was apparently the same habitat. What I'd stumbled on turned out to be another signal of animal culture - hunting behaviour. All wolves hunt, but what they hunt varies. It has to, because different prey species prefer different habitats. Wolves below Canada's tree line, for example, eat deer and moose - animals that tend not to move around much. Wolves in the tundra mostly eat barren ground caribou - animals famous for their long-distance migrations. And wolves in the tundra were sorting themselves into populations that corresponded with the migration ranges of their prey. What this suggests is that wolves are doing more than passing distinctive dialects down to their young. They are teaching their pups how to hunt particular food types. And once the pups learn effective hunting strategies, they tend to stay in an area where they can use those strategies. Because tundra wolves are most often mating with other tundra wolves, their genes as well as their behaviour will diverge from those of wolves in other areas. Interested in learning more about animal communication? 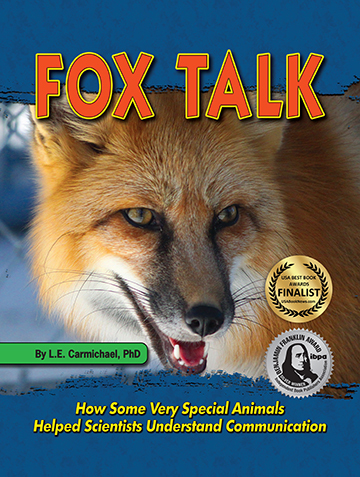 Check out Fox Talk: How Some Very Special Animals Helped Scientists Understand Communication. If the video doesn't load here, you can see it by clicking on this link. Click on it anyways if you're interested in eclipses! On that webpage, NASA writers have posted several short comments with interesting pictures on their studies of eclipses and the sun. Most important among these comments is the advice on eye safety when observing a solar eclipse -- that's a must read for anyone!